This article is about densely populated regions. For the core of such regions, see Metropolis. For other uses, see Metropolitan (disambiguation). "Metro area" redirects here. For the dance music duo, see Metro Area. Metropolitan areas may themselves be part of larger megalopolises. For urban centres outside metropolitan areas, that generate a similar attraction at smaller scale for their region, the concept of the regiopolis and respectively regiopolitan area or regio was introduced by German professors in 2006. In the United States, the term micropolitan statistical area is used. A metropolitan area combines an urban agglomeration (the contiguous, built-up area) with zones not necessarily urban in character, but closely bound to the center by employment or other commerce. These outlying zones are sometimes known as a commuter belt, and may extend well beyond the urban zone, to other political entities. 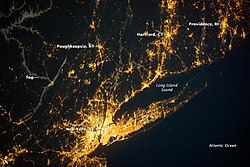 For example, Islip, New York on Long Island is considered part of the New York metropolitan area. In practice, the parameters of metropolitan areas, in both official and unofficial usage, are not consistent. Sometimes they are little different from an urban area, and in other cases they cover broad regions that have little relation to a single urban settlement; comparative statistics for metropolitan area should take this into account. Population figures given for one metro area can vary by millions. There has been no significant change in the basic concept of metropolitan areas since its adoption in 1950, although significant changes in geographic distributions have occurred since then, and more are expected. Because of the fluidity of the term "metropolitan statistical area," the term used colloquially is more often "metro service area," "metro area," or "MSA" taken to include not only a city, but also surrounding suburban, exurban and sometimes rural areas, all which it is presumed to influence. A polycentric metropolitan area contains multiple urban agglomerations not connected by continuous development. In defining a metropolitan area, it is sufficient that a city or cities form a nucleus with which other areas have a high degree of integration. See also the many lists of metropolitan areas itemized at § Lists of metropolitan areas. The Australian Bureau of Statistics defines Greater Capital City Statistical Areas (GCCSAs) as the areas of functional extent of the seven state capitals and the Australian Capital Territory. GCCSAs replaced "Statistical Divisions" used until 2011. In Brazil, metropolitan areas are called "metropolitan regions". Each State defines its own legislation for the creation, definition and organization of a metropolitan region. The creation of a metropolitan region is not intended for any statistical purpose, although the Brazilian Institute of Geography and Statistics uses them in its reports. Their main purpose is to allow for a better management of public policies of common interest to all cities involved. They don't have political, electoral or jurisdictional power whatsoever, so citizens living in a metropolitan region do not elect representatives for them. Statistics Canada defines a census metropolitan area (CMA) as an area consisting of one or more adjacent municipalities situated around a major urban core. To form a CMA, the metropolitan area must have a population of at least 100,000, at least half within the urban core. To be included in the CMA, adjacent municipalities must have a high degree of integration with the core, as measured by commuter flows derived from census data. In Chinese, there used to be no clear distinction between "megalopolis" (城市群, lit. city cluster) and "metropolitan area" (都市圈) until National Development and Reform Commission issued Guidelines on the Cultivation and Development of Modern Metropolitan Areas (关于培育发展现代化都市圈的指导意见) on Feb 19, 2019, in which a metropolitan area was defined as "an urbanized spatial form in a megalopolis dominated by (a) supercity(-ies) or megacity(-ies), or a large metropolis playing a leading part, and within the basic range of 1-hour commute area." The European Union's statistical agency, Eurostat, has created a concept named Larger Urban Zone (LUZ). The LUZ represents an attempt at a harmonised definition of the metropolitan area, and the goal was to have an area from a significant share of the resident commute into the city, a concept known as the "functional urban region". France's national statistics institute, the INSEE, names an urban core and its surrounding area of commuter influence an aire urbaine (official translation: "urban area"). This statistical method applies to agglomerations of all sizes, but the INSEE sometimes uses the term aire métropolitaine (metropolitan area) to refer to France's largest aires urbaines. In German definition, metropolian areas are eleven most densely populated areas in the Federal Republic of Germany. They comprise the major German cities and their surrounding catchment areas and form the political, commercial and cultural centres of the country. For urban centres outside metropolitan areas, that generate a similar attraction at smaller scale for their region, the concept of the Regiopolis and respectively regiopolitan area or regio was introduced by German professors in 2006. In India, a metropolitan city is defined as, one having a population of 2 million and above. The Greater Johannesburg metropolitan area is the largest metropolitan area in South Africa. Its population was over 9.6 million as of the 2011 South Africa Census, in contrast to its urban area, which consisted of approximately 7.9 million inhabitants as of 2011. Conversely, metropolitan municipalities in South Africa are defined as commonly governed areas of a metropolitan area. The largest such metropolitan municipal government entity in South Africa is the City of Johannesburg Metropolitan Municipality, which presided over nearly 5 million people as of 2016. However, the Greater Johannesburg metropolitan area houses roughly ten times the population of its core municipal city of Johannesburg, which contained 957,441 people as of the 2011 census. Sweden defines a metropolitan area as a group of municipalities, based on statistics of commuting between central municipalities and surrounding municipalities and taking into account existing planning cooperation in the country's three geographic regions. They were defined around 1965. In 2005, a number of further municipalities were added to the defined areas. The word metropolitan describes a major city in Turkey like Istanbul, a city that is dominant to others both financially and socially. There are 16 officially defined "state metropolitan areas" in Turkey, for governing purposes. The United Kingdom government's Office for National Statistics defines "travel to work areas" as areas where "at least 75% of an area's resident workforce work in the area and at least 75% of the people who work in the area also live in the area". As of February 28, 2013, the United States Office of Management and Budget (OMB) defined 1,098 statistical areas for the metropolitan areas of the United States and Puerto Rico. These 1,098 statistical areas comprise 929 Core-Based Statistical Areas (CBSAs) and 169 Combined Statistical Areas (CSAs). The 929 Core-Based Statistical Areas are divided into 388 Metropolitan Statistical Areas (MSAs – 381 for the U.S. and seven for Puerto Rico) and 541 Micropolitan Statistical Areas (μSAs – 536 for the U.S. and five for Puerto Rico). The 169 Combined Statistical Areas (166 for the U.S. and three for Puerto Rico) each comprise two or more adjacent Core Based Statistical Areas. The Office of Management and Budget defines a Metropolitan Statistical Area as one or more adjacent counties or county equivalents that have at least one urban area of at least 50,000 population, plus adjacent territory that has a high degree of economic and social integration with the core as measured by commuting ties. The OMB then defines a Combined Statistical Area as consisting of various combinations of adjacent metropolitan and micropolitan statistical areas with economic ties measured by commuting patterns. The Office of Management and Budget further defines a core-based statistical area (CBSA) to be a geographical area that consists of one or more counties (or equivalents) anchored by an urban center of at least 10,000 people plus adjacent counties that are socioeconomically tied to the urban center by commuting. ^ Mark, M.; Katz, B; Rahman, S.; Warren, D. (2008). "MetroPolicy: Shaping A New Federal Partnership for a Metropolitan Nation" (PDF). Brookings Institution. pp. 4–103. ^ "Definition of Urban Terms" (PDF). demographia.com. Retrieved 22 October 2013. ^ Prof. Dr. Iris Reuther (FG Stadt- und Regionalplanung, Universität Kassel): Presentation "Regiopole Rostock". 11 December 2008, retrieved 13 June 2009 (pdf). ^ "Metropolitan and Micropolitan". Retrieved 27 April 2016. ^ "Greater Capital City Statistical Areas" (PDF). Australian Bureau of Statistics. February 2013. ^ "Census metropolitan area (CMA) and census agglomeration (CA)". Statistics Canada. 2007-12-11. Retrieved 2011-03-06. ^ "关于培育发展现代化都市圈的指导意见(发改规划〔2019〕328号)" (in Chinese). 国家发展改革委. 2019-02-19. ^ "Urbanaudit.org". urbanaudit.org. Archived from the original on 2009-02-12. ^ "INSEE – Definitions and Methods – aire urbaine". INSEE France. Retrieved 2013-09-25. ^ "Metropolitan Cities of India" (PDF). Central Pollution Control Board. National Informatics Centre. p. 3. Archived from the original (PDF) on 23 September 2015. Retrieved 28 July 2014. ^ Geografin i statistiken – regionala indelningar i Sverige / Geography in statistics – regional divisions in Sweden (SCB, mostly in Swedish. See page 24. ^ "Türk Dil Kurumu, Yabancı Sözlere Karşılıklar Kılavuzu, "metropol"". tdkterim.gov.tr. Archived from the original on 2011-07-21. ^ "OMB Bulletin No. 13-01: Revised Delineations of Metropolitan Statistical Areas, Micropolitan Statistical Areas, and Combined Statistical Areas, and Guidance on Uses of the Delineations of These Areas" (PDF). United States Office of Management and Budget. February 28, 2013. Archived from the original (PDF) on March 19, 2013. Retrieved April 2, 2013. ^ The United States Office of Management and Budget (OMB) defines a Core-Based Statistical Area (CBSA) as one or more adjacent counties or county equivalents that have at least one urban core area of at least 10,000 population, plus adjacent territory that has a high degree of social and economic integration with the core as measured by commuting ties. ^ The United States Office of Management and Budget (OMB) defines a Metropolitan Statistical Area (μSA) as a Core Based Statistical Area having at least one urban cluster of at least 50,000 population, plus adjacent territory that has a high degree of social and economic integration with the core as measured by commuting ties. This page was last edited on 3 April 2019, at 02:53 (UTC).